Home » Food and Nutrition » Does Drinking Water Help You Lose Weight? 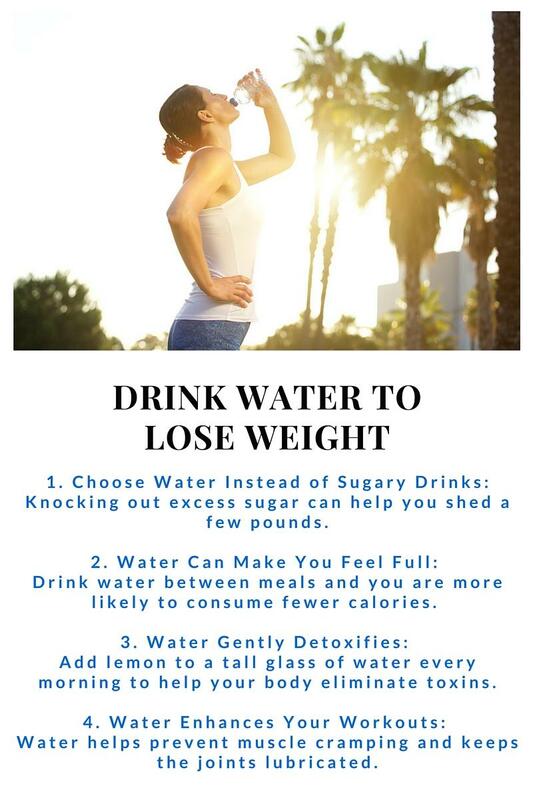 Does drinking water help you lose weight? It most certainly can. When we swap out sugar-laden soda, energy, and sports drinks for fresh, clean, calorie-free water, we are automatically reducing our calorie and sugar intake. Sugar, as many of us know by now, is a key contributor to rising obesity rates not only in the United States but globally. The World Health Organization (WHO) reports that since 1980 worldwide obesity has doubled and that in 2014, global numbers were at 1.9 billion adults being overweight with 600 million of those considered obese. When we swap out sugar-laden soda, energy, and sports drinks for fresh, clean, calorie-free water, we are automatically reducing our calorie and sugar intake. A study published in 2007 in The American Journal of Clinical Nutrition (1) came to the conclusion that sugar intake, fructose in particular, plays a part in the rise of cardiovascular disease, which in turn suggests that fructose may also play a role in obesity, which is linked to cardiovascular disease. More studies need to be done to prove the hypothesis, but it seems that the rise in sugar intake corresponds with the rise in people who are overweight and diabetic. So, what does this have to do with water for weight loss? Well, if people drank more water and fewer sugary drinks, many of these health issues could be reduced. It’s not the only answer, but it’s certainly a good place to start. Does water help you lose weight? Water in and of itself will not help you lose weight—if it were that simple, we wouldn’t have a billion-dollar weight-loss industry. However, water and weight loss do go hand in hand for a number of reasons. If you love water, weight loss may be easier for you, because it won’t be tough to give up sugary drinks. But even if you don’t like water, you should ease up or eliminate the sugary drinks anyway—it’s an easy way to cut some major calories. If you absolutely can’t give up those drinks cold turkey, try easing yourself into drinking more water by adding a drop of flavor enhancer to it. These are made with sugar substitutes, including sucralose, and though they’re not a great solution, they could help get you through that adjustment period. Work your way toward clean water, though, without the additives. Knocking out excess sugar can help you shed a few pounds. It’s an old trick used by many people: fill up on water to feel full. It works. Drink water between meals and you are more likely to consume fewer calories. Don’t substitute water for food, of course—that’s unhealthy—but do opt for water with meals instead of other beverages. As a bonus, it will help clean out the system too. Add lemon to a tall glass of water every morning to help your body eliminate toxins and waste a little more efficiently. Consume a few glasses throughout the day for better results. Water on its own will also do the trick. It can flush your system of impurities, and help the kidneys and liver do their jobs in managing and eliminating waste. And this can translate into weight loss! When going to the gym, be sure to drink enough water, and not just because you will sweat a lot. Water helps prevent muscle cramping and keeps the joints lubricated so by staying well hydrated you are potentially making it possible for you to work out longer and harder…and that means weight loss. A good rule of thumb is to drink enough water before you feel thirsty. While the body does a pretty good job of signaling when it needs more fluids, thirst isn’t always the most reliable gauge. A better indicator is the color of your urine—it might sound strange, but it will tell you everything you need to know. Pale yellow urine is what you want, as it indicates a balanced level of hydration; very dark yellow urine indicates dehydration. As a general guideline, you should be drinking one to two liters of water per day, but again, it varies depending on the individual. On the other side of the hydration spectrum, there is such a thing as drinking too much water. It’s rare, because the body generally controls how much water it needs, but it can happen when you drink too much in too short a time—say, in a water-drinking contest (those actually exist), or if you’re working out vigorously or running a marathon and end up overcompensating for the lost water. Sometimes, certain medical conditions can cause you to drink more or to retain water as well. Whatever the cause, over-hydration can lead to water intoxication or hyponatremia, a condition in which the level of sodium in the blood is dangerously low. This isn’t to say that increasing your intake of water will, with certainty, lead to such conditions, but all the same it’s better to err on the side of caution. Adding cucumber, oranges, limes, lemons, and berries can all make for tastier water. So, does drinking water help you lose weight? It definitely can. And it doesn’t have to be plain and boring. 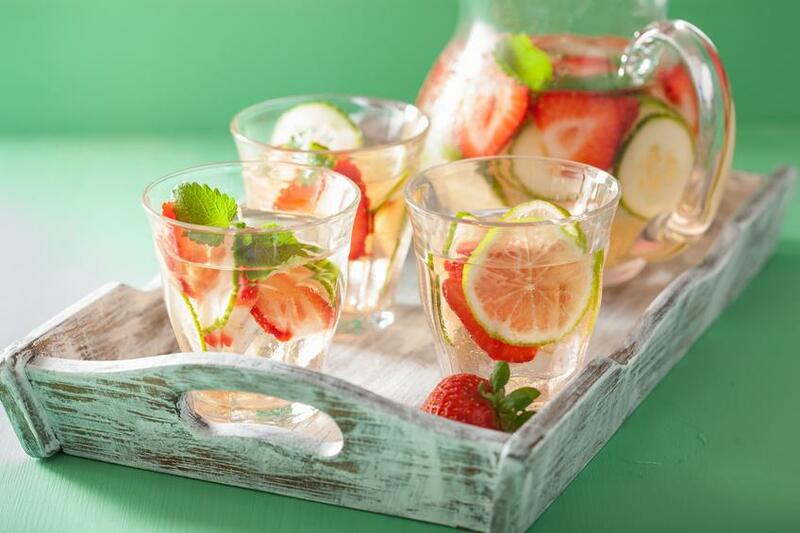 Get creative with ways to flavor your water. Adding cucumber, oranges, limes, lemons, and berries can all make for tastier water. Simply slice them up, add them to a jug, and allow them to steep overnight. And after the jug is empty, you can eat the fruit too!